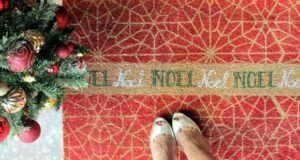 Do you like to create centerpieces or table runners for holiday entertaining? I love the concept, but I have one issue – there is no dining room in our home! Actually we would rarely use one, but having no large dining table is challenging when our family arrives Christmas Day for late afternoon drinks and delectable nibbles. However, we do have a huge peninsula to use for serving, thank goodness! Plus a large rustic coffee table in the adjacent living room and a round glass table in the open kitchen. 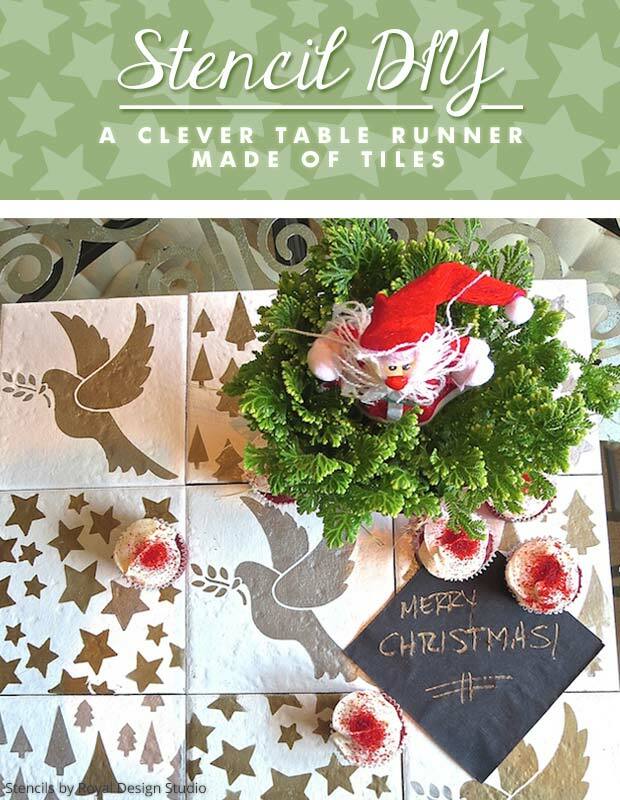 With these surfaces in mind, I decided to create a fun “runner” made of porcelain tiles. My original concept was so inspired – I could envision a long table just full of these hand-painted beauties running down the center. Since I can’t do that, maybe you can! 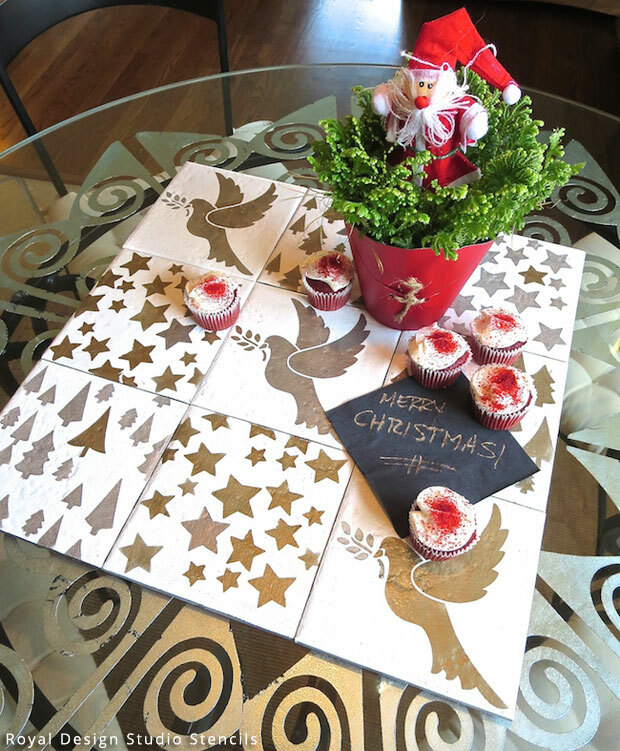 The fun part is that every tile is designed to serve as a gift for your guests as they depart the festivities! So plan to make as many as you will need with that goal in mind. These are quick, child-friendly goodies to create when the kiddos are out of school. We are using them for the holidays, but birthdays and all occasions would be perfect too. Even a wedding! Tiles in any size. I purchased these at the Habitat ReStore for about 50 cents. I avoided the ceramic ones since they break more easily. 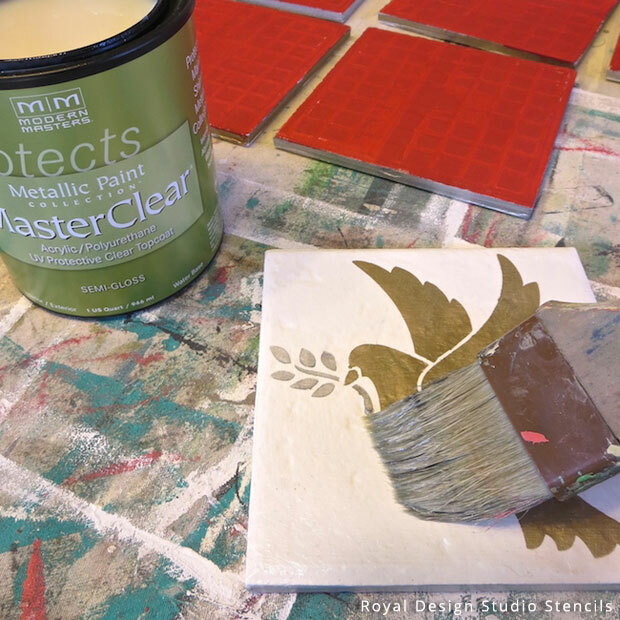 Clean the tiles, paint one or two coats of Pure White Chalk Paint® by Annie Sloan and let dry. Arrange them in a pleasing pattern and determine how the colors and patterns will lay out. I used three stencil designs and two colors of stencil crème to alternate. That way I could make a square of 3 by 3. 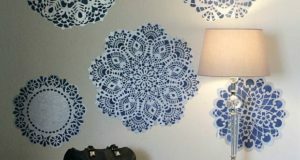 Dip the tips of the stencil brush into the stencil crème and remove all excess on paper towels. Using a swirling motion, stencil the patterns. 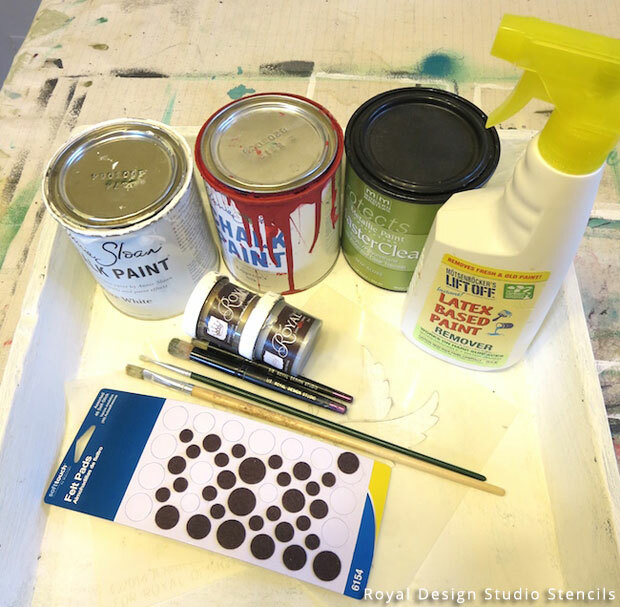 Learn more about basic brush stencil techniques using royal stencil crèmes on this blog post. My pine trees and star stencils allowed for a random placement. 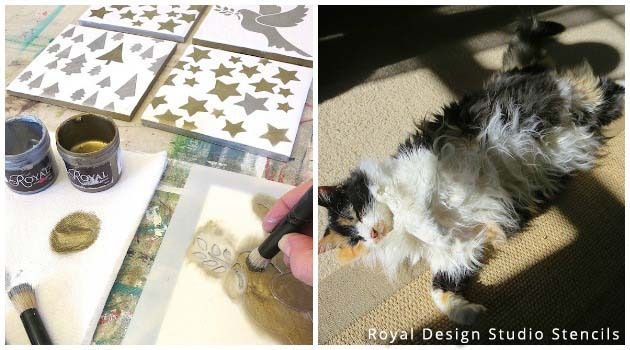 When all of your tiles are stenciled, use a flat, stiff brush to paint the edges. I decided to make one of the designs on each tile and the edges, the opposite color. So if the dominant color was gold, I used silver for just one design and the edges. 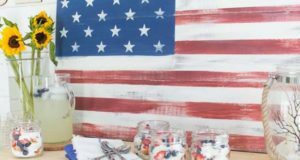 During this process, keep your fingers crossed that your kitty assistant would rather sleep in the sun than jump in the big middle of your wet paint for a photo op like usual. 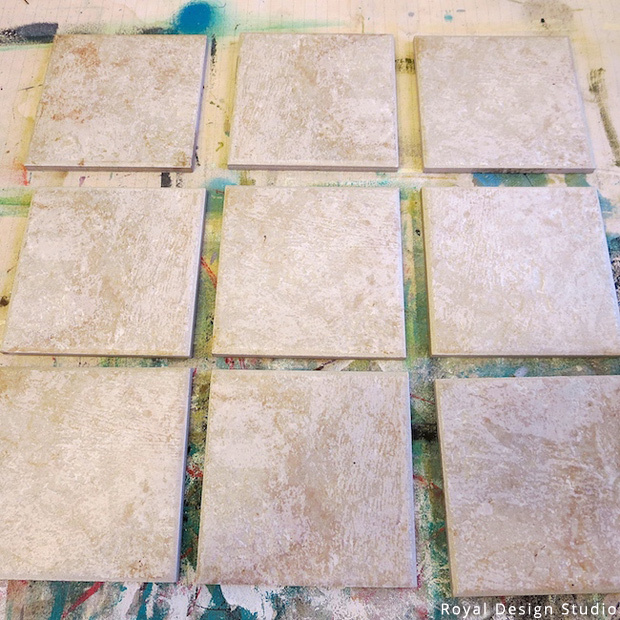 Paint the backs of the tiles with one or two coats of Emperor’s Silk and let dry. To seal, paint two or more coats of MasterClear on all sides, following manufacturer directions. Let dry. Add four felt pads on the back of each tile. Now you just need a little soirée to show off your handiwork and creativity. I placed my tiles on our glass kitchen table that is central to our kitchen and living room. I love them on top of my Paint+Pattern verre eglamisé project. 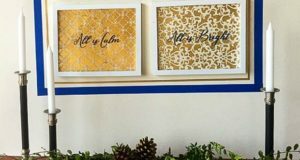 It’s another glitzy but easy project you may want to try for the holidays. 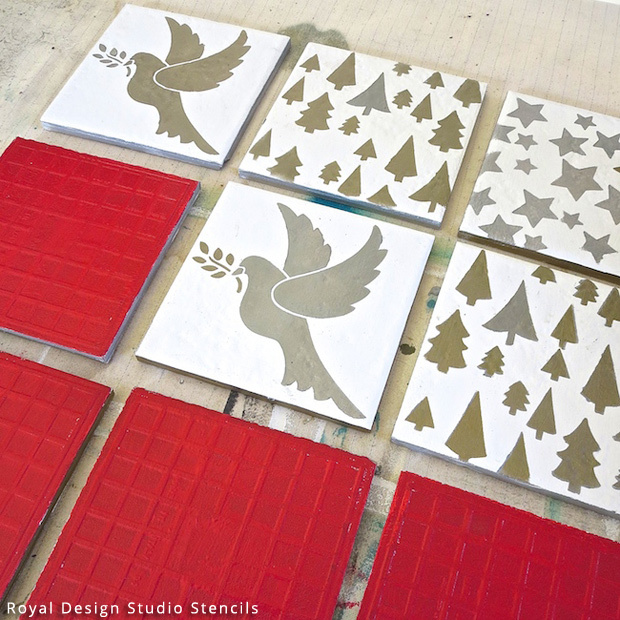 Stay tuned for inspiring holiday stencil ideas all month on Paint + Pattern! Excellent post. I was checking constantly this blog and I am impressed! Extremely useful info specifically the last part 🙂 I care for such information much. I was looking for this particular information for a very long time. Thank you and good luck.